As of April 2019, companies who hire a minimum of 250 employees or exceed an annual income of £360m and an annual balance sheet of £18m are legally required to announce their energy usage and carbon emissions. 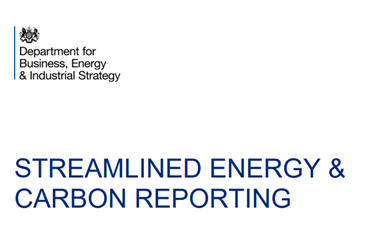 The Streamlined Energy and Carbon Reporting (SECR) regulations have been designed to simplify carbon and energy reporting along with expanding the number of companies who comply to report compliance by nearly ten times as much from 1200 to 11,900. Organisations that use fewer than 40,000kWh of energy in a year will be free from charges. Organisations will be expected to report carbon emissions in the annual reports in order to reduce administrative burdens in line with the Taskforce on Climate related Financial Disclosures. Scope 1 (direct) and 2 (indirect emissions from purchased energy) emissions will have to be recorded with Scope 3 (indirect not mentioned above) emissions being optional. Energy usage will be reported inclusive of electricity, gas and transport such as roads, rail, air and shipping. IEMA consider this a “significant step forward” after providing extensive research towards the initial carbon reporting consultation in 2012 and dedicating ten years to the issue at hand. The contribution of these new companies will subsidise towards an increase in energy efficiency of 20% by the year 2030. The government’s response document commended IEMA for organising workshops with energy professionals as part of their consultations over the past year. Nick Blyth, IEMA policy lead responded “We are very pleased to see some of our central recommendations adopted. The government’s commitment towards a reporting requirement for all large businesses is a significant step forward. “Mandatory reporting will support improved energy management and provide a helpful level playing field for businesses.” According to The Department for Business, Energy and Industrial Strategy (BEIS), the new SECR framework could potentially replace the “rigid” CRC Energy Efficiency Scheme. As a result, the government states that the policy package of introducing the SECR framework, closing the CRC scheme and increasing climate change levy rates would accumulate an estimated net societal benefit of £1.5bn. Nick Blyth also added “We will continue to support BEIS with professional evidence on the important contribution of mandatory reporting and offer practical support and guidance”.